Following up with Are investors getting overly optimistic again? I pointed out that investor sentiment as measured by the AAII Investor Sentiment Survey had shifted to a point of unusually high bullishness. After prices trend up, investors get more optimistic as they extrapolate higher prices into the future, assuming that existing trends will continue. Interestingly, they get more bullish as prices are more “overvalued”. As more and more investors become optimistic about stocks in the months ahead, you have to wonder who will continue the buying needed to push stocks higher. A good trend follower knows that trends do indeed often continue, until the demand runs out. Since supply and demand is the driver of all things traded in an auction market, we can observe demand shifts and how it drives prices. Since I wrote Are investors getting overly optimistic again? 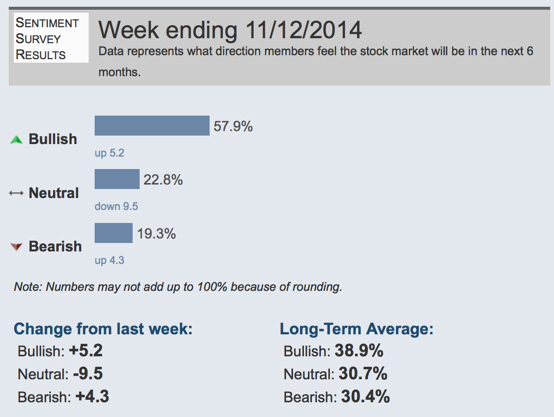 less than two weeks ago, the latest AAII Investor Sentiment Survey shows bullishness is even higher. In the mean time, Fox Business reports this morning “Japan’s economy unexpectedly slipped into recession in the third quarter”. That shouldn’t be a big surprise. If you take a look at the weekly chart of the Japan stock index (priced in Dollars) below, it’s been suggesting something for the past year. I am seeing similar trends (or choppy non-trends) in many global stock markets. It will be interesting to watch how it all unfolds. « Asymmetrical Risk Definition and Symmetry: Do you Really Want Balance?